Human Ants. In a line scrambling up a massive sand dune in the dark. This was not my idea of fun. 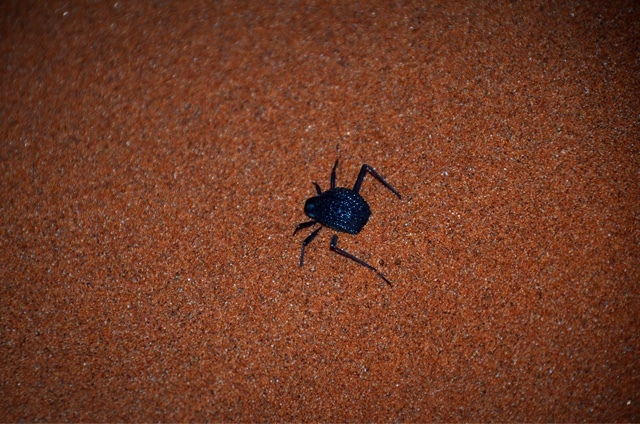 But I joined the ant line and started trudging my way up that dune, heart pounding and breath rattling. Feet slipping back six inches for every foot gained. 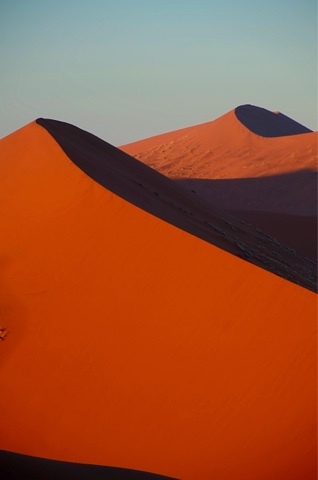 All in the quest of viewing one of the most photographed daybreakson the planet … sunrise over the famed Namibian red dunes. We were up at 4:30 in the morning after getting a coveted camping spot inside the park at Sesrium at the entrance of the valley of the dunes. This was not a great campground, but it did allow us to get in the queue of cars so when the gate opens we could be among the first in a long line of cars rushing into the dunes. If you were late, you would miss the sunrise. Once inside the park, every vehicle made for the same parking lot, and then all the ants poured out and started climbing in a noisy, humming line of creeping humanity. While our guide drove sanely at the park speed limit, others careened past in the mad scramble to get their ants unloaded at the dune first. I thanked our guide for being safe. I was grateful nobody hit an oryx rushing into the park in the dark. I grumbled up the first part of the dune. But as I climbed and as the light filled the sky, my black mood lifted with the sun. 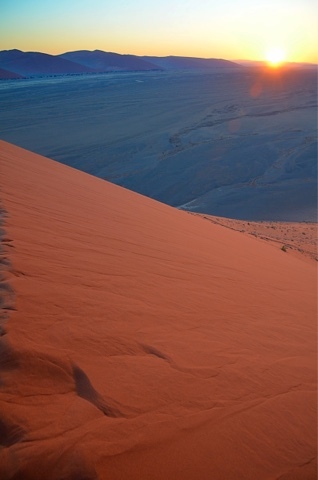 The sky turned pink and then white and the dunes – a surreal terra cotta soft shimmering sand – glowed more beautifully with the light. Like someone turned on a magical light from within the earth. They looked different every few minutes as the light continued to change. This is truly one of the most beautiful spots I’ve ever seen. Has to be one of the most beautiful spots on earth. Really. So beautiful it was worth a 430 AM start and being a tourist ant trudging the tourist congo-line up that dune in the dark. And I don’t give the nod of approval to something that has devolved into this level of tourist hell lightly. After the sunrise the mobs headed back down to their breakfast in the parking lot. I lingered on the top of the dune and walked all the way out to the end on a skinny sand shelf – balancing on a foot-wide ledge flattened by earlier feet. 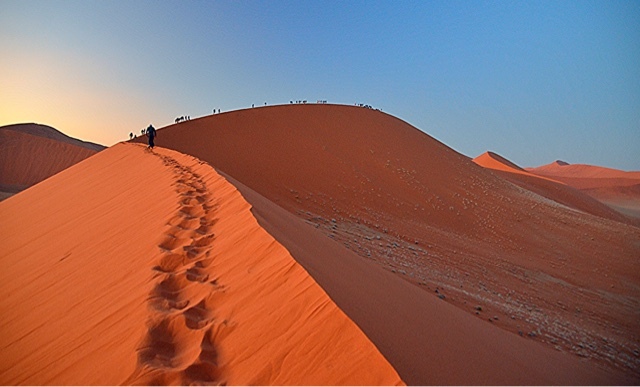 The perfect pointed ridge of the untrampled dune stretched unblemished by humanity in front of me. The steep terra-cotta sand sloped hundreds of feet below me on either side. And looking down that steep slope I realized that if i fell … so what? It would be like landing in the world’s softest slide and flowing down until friction stopped me unharmed. There is a lightness to knowing that you can fling yourself hundreds of feet down a steep slope, brush off the sand and walk away. Now this was worth it. And by the time we packed up and headed deeper into the park, the wind had already blown the sand over the trail of footprints, and was already reshaping that dune back to its perfectly sculpted smooth pyramid … just like it had stood for thousands of years before humans decided they were beautiful. Deeper inside the park gave time for a little more exploring, including climbing a second dune and – better – running down with feet sinking in that deep silky sand was just sheer fun. 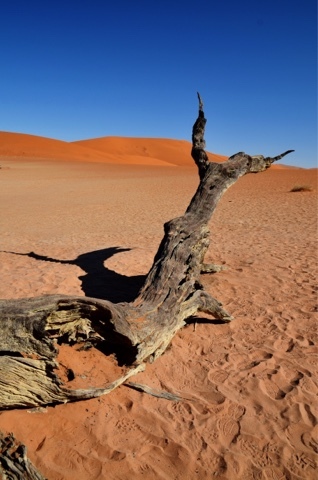 The dry lake and 700 year old dead trees surrounded by the huge red dunes was stunning. 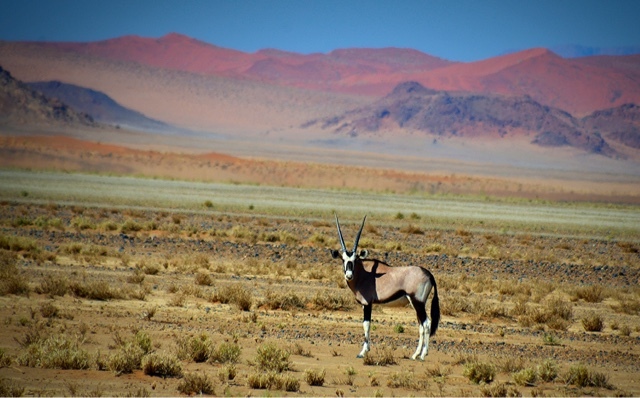 Oryx and springbok love this dry desert land, and they were not only in the park but visited the campsite at night. 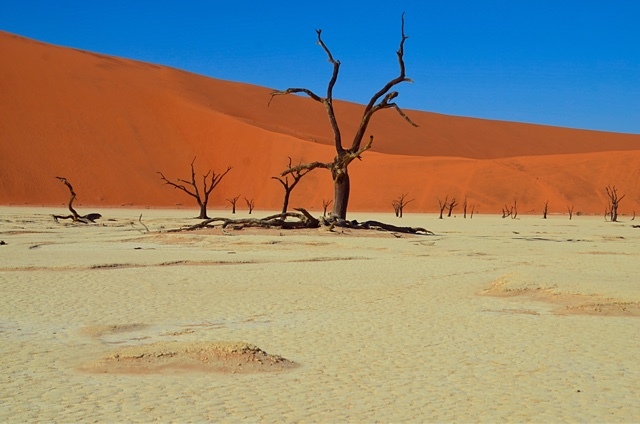 And when there is rain, the river runs and floods up the the base of the dunes – the Sossusvlei – and brings thousands of flamingos in from the coast to breed. And that is something I would come back here to see. Tourist ants be damned. A fog beatle waits just over the lip of the dune. It gets moisture when the early morning fog crests the dune and rains moisture on the other side before it disappears.